FuseBox Radio Broadcast for Week of October 1, 2008 | BlackRadioIsBack.com - Official Blog of the Syndicated FuseBox Radio Broadcast! This is the FuseBox Radio Broadcast with DJ Fusion & Jon Judah for the week of October 1, 2008 with some new and classic Hip-Hop & Soul music, news and commentary. This week's commentary covered the recent developments in the U.S. Presidential Election and economic situation along with some other things. 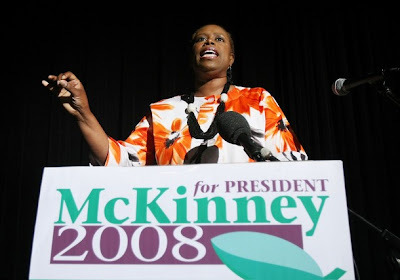 The FuseBox Radio Broadcast had the honor to do an interview with the Green Party's Candidate for the U.S. Presidency, former Democratic Congresswoman Cynthia McKinney (http://votetruth08.com). Some of the things covered this interview included the importance of the right and power in both registering AND voting, her party's platform and issues, the ups and downs of this current U.S. Presidential Election in regards to media coverage and so forth, long term corruption in the U.S. government, and more! There are no new Direct EFX and Black Agenda Report segments with Glenn Ford this week due to our interview.